As in 2017 Arriva bought ex Connexxion buses to serve on the Keukenhpf seasonal routes. 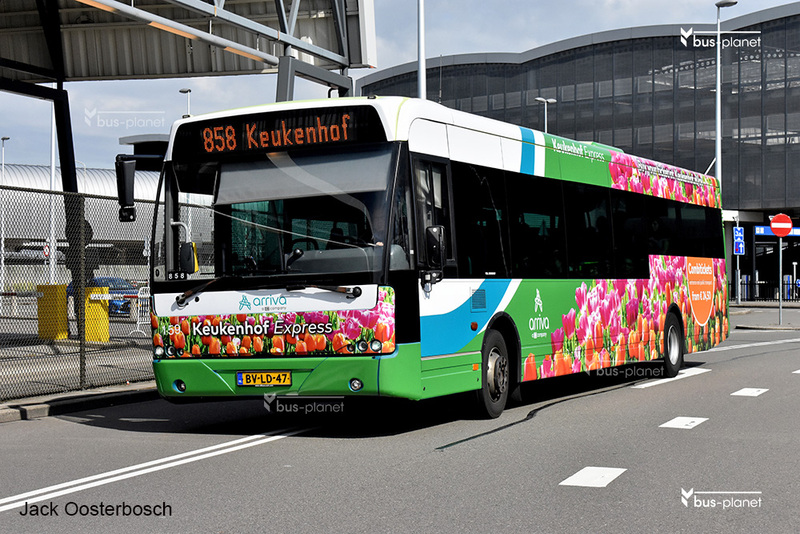 This time six buses came and received a special Keukenhof livery. They are numbered (0)158-(0)163, with the leading 0 not applied on the buses. They are ex Connexxion 4229, 4264, 4254, 4235, 4258, 4265. These buses belonged to the former Connexxion Utrecht concession. The Arriva numbering follows on 0151-0157, identical secondhand buses bought beginning of 2018 for the Achterhoek concession. After the Keukenhof closure the 0158, 0160 and 163 were returned to VDL, the 159, 161 and 162 were re-assigned to the Achterhoek area in the normal Arriva livery. Picture(s) taken by Jack Oosterbosch. Netherlands. Schiphol. dd: 2018-03-30.